My name is at the top and at the bottom you can see the companies I have founded. Many of them are either directly or indirectly related to bicycle tourism. 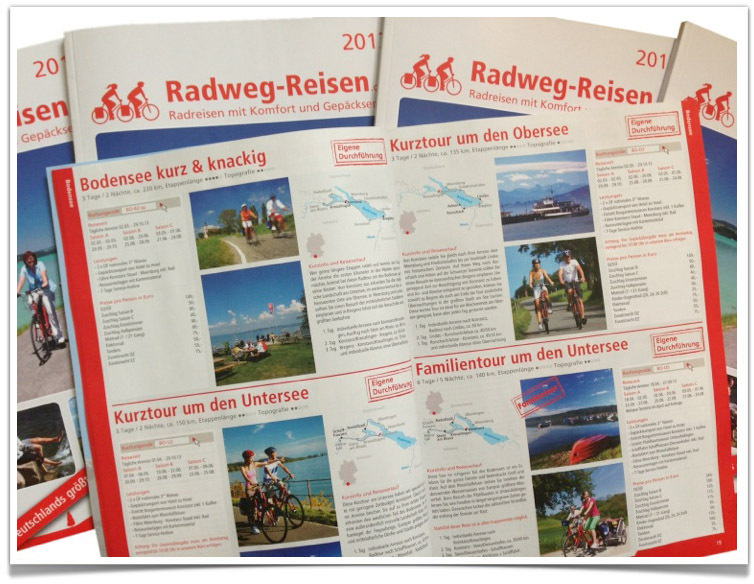 Radweg-Reisen is, for example, the biggest cycling tour operator in Germany, while Bikemap, which registers up to 15 million page views per month, probably represents the largest collection of cycling routes on the Internet. In short: I’m really into bicycle tourism! First, what are the most popular cycle paths in the world? I mean the ones with the most cycle tourists? 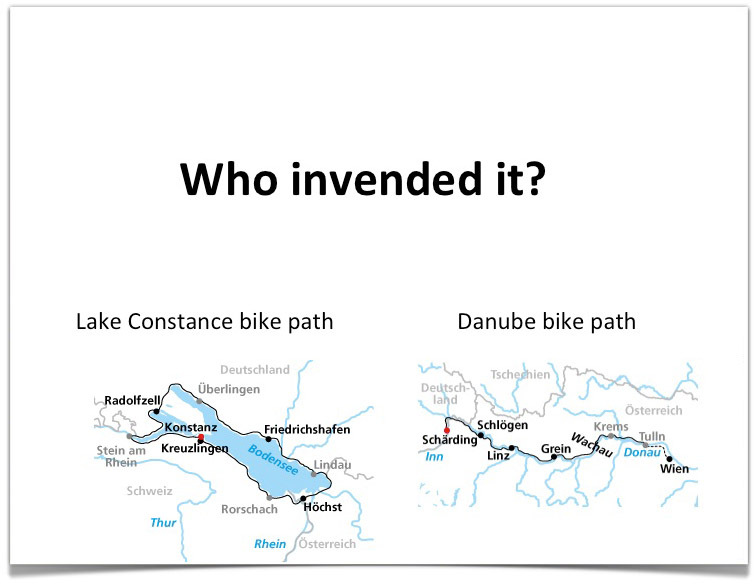 Answer: The Lake Constance cycle path and the Danube cycle path. And they are way ahead of the others. Second: Who „invented“ these tourism brands, as they are perceived by the public? A tourism association? A tourist information office? A politician? Something to do with aid money? It was the cycle tour operators themselves. And now for a few figures about the Lake Constance cycle path, because that’s the one I know best. 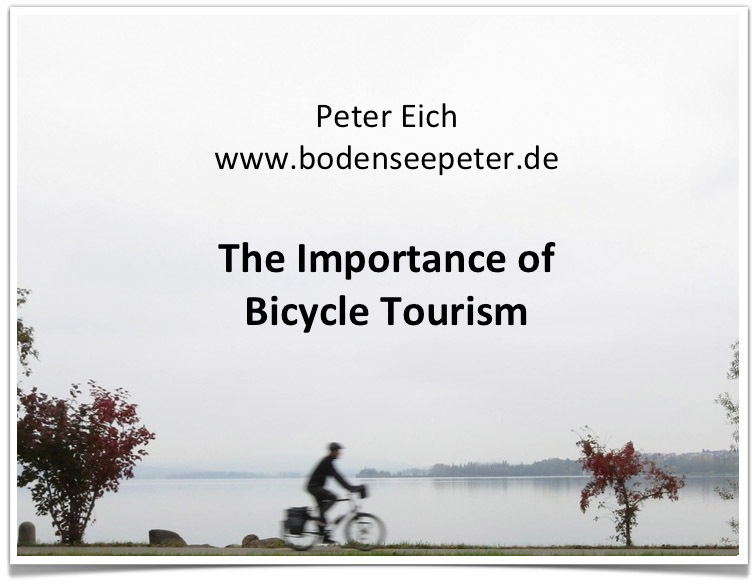 Of the roughly 3 million arrivals to Lake Constance, about 220,000 of these tourists are cyclists: bike tourists who want to go on a bike tour over several days. This isn’t much in comparison to the total amount of tourists coming to Lake Constance. Because it’s only 7 per cent. So only every 14th tourist. Not such a big deal you might think. But just wait a few more slides! 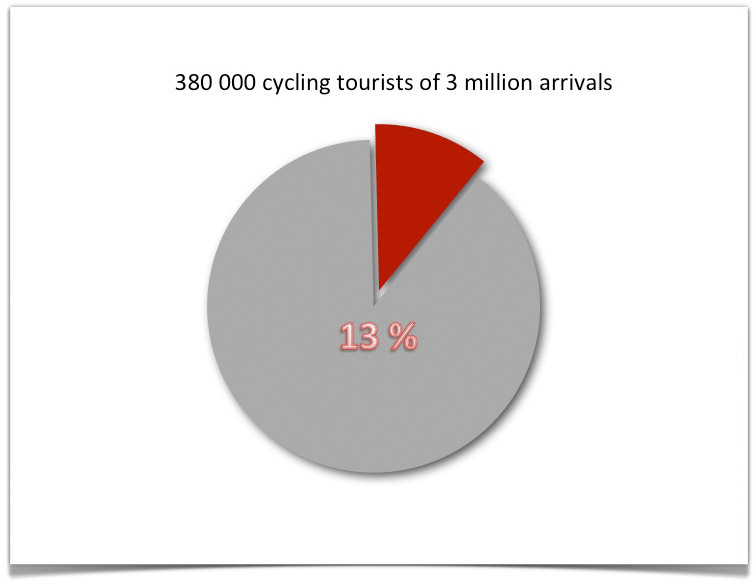 If you add to this all the individual day trippers on bikes, we arrive at a total of 380,000 holiday-makers on bikes. Now we’re up to 13%. But I have still more figures for you! The average tourist coming to Lake Constance stays for 2.5 nights. That includes the cyclists. And they stay for an average of 6.3 nights. 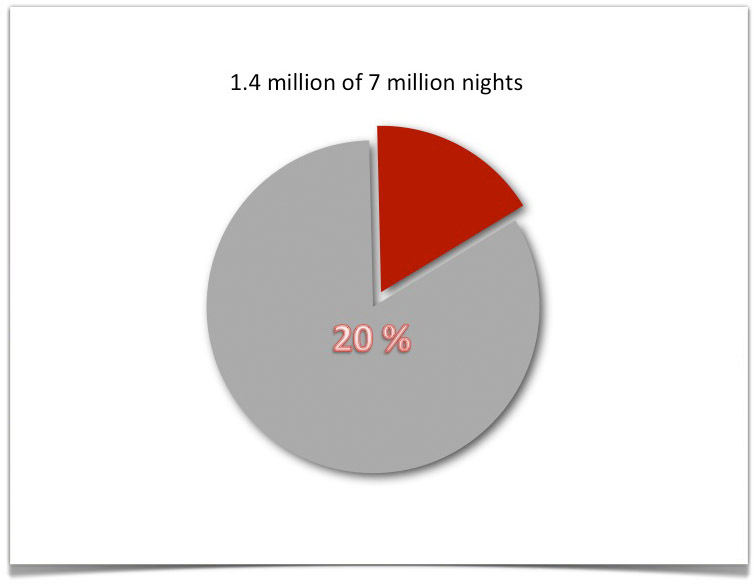 So if you multiply the number of tourists by the nights (which is pretty much equal to the sales), we’re talking about 1.4 million nights spent by cyclists in comparison to 7 million nights on Lake Constance in total. That’s an incredible 20%, or every 5th night. But I have even more figures for you! Right now, we’re at the Eurobike trade fair. And it’s September. Everyone here in the room knows that Lake Constance is completely booked up at the moment. It’s always the same during Eurobike. And it’s the same story throughout July and August. In other words: even the poorest hotel is fully booked – right down to the very last room – in July and August. And yet hotel owners don’t rate the year based on the peak season. And they don’t base it on the winter season either, as hardly anyone goes on holiday then. All that’s left is the pre- and off-season. Let’s have a look to see when the tourists come here. 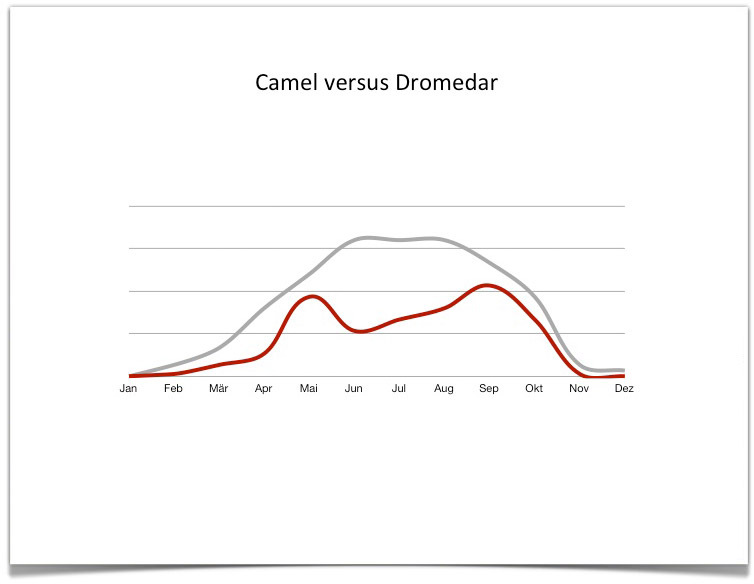 The curve looks a bit like a dromedary camel – with one big hump in the peak season. To compare, let’s have a look at the spread of bike tourists. They don’t want to be pedalling away during the really hot weather. That’s why we see the curve peaking ….. Ta dah! …. In the pre- and off-season! And they form two curves, like a two-humped camel. 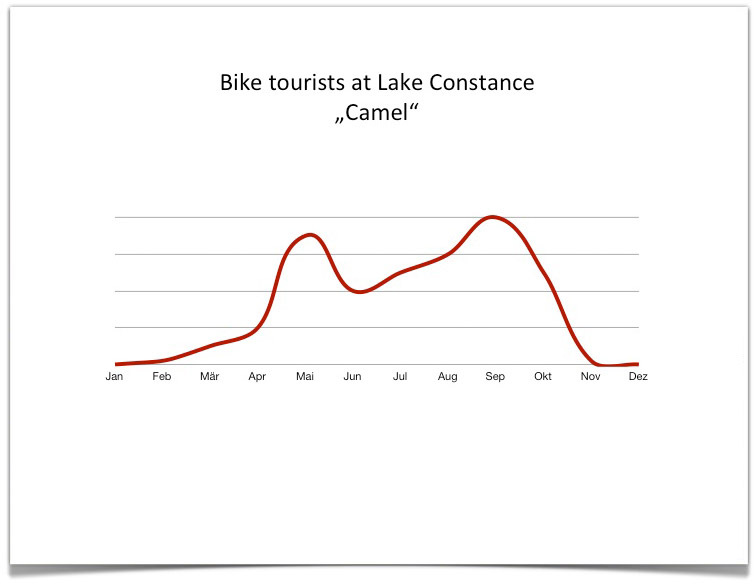 Right, the relevance of bike tourists increases even further. This has to do with: one – the nights spent, and two – the restriction to the period of time and the season. Bearing this in mind we reach a figure of 33%. Which is every third night in the relevant period. And that’s the cyclists, who represent only 7% of tourists and therefore tend to be disregarded. Whereas now we see that they are actually spending every third euro here in the area. Let’s move on to my second issue: How can you attract more of these cyclists to your area? I happen to have an idea! 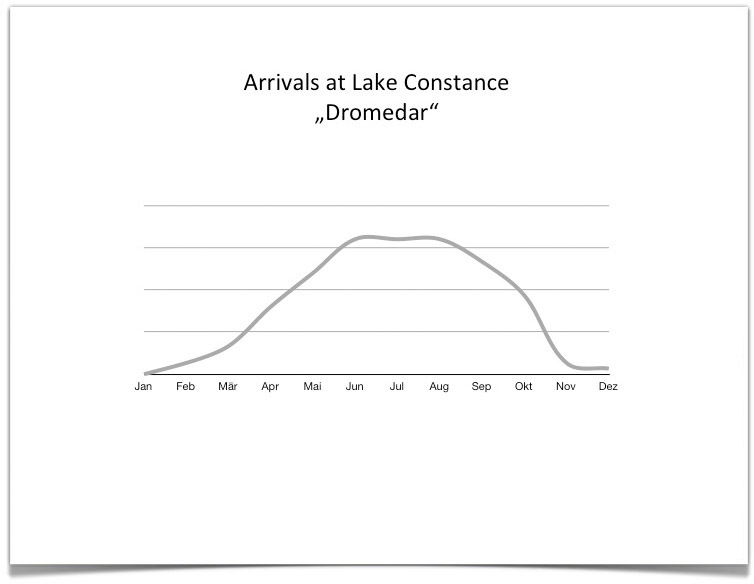 Let’s have a look at the following chart. 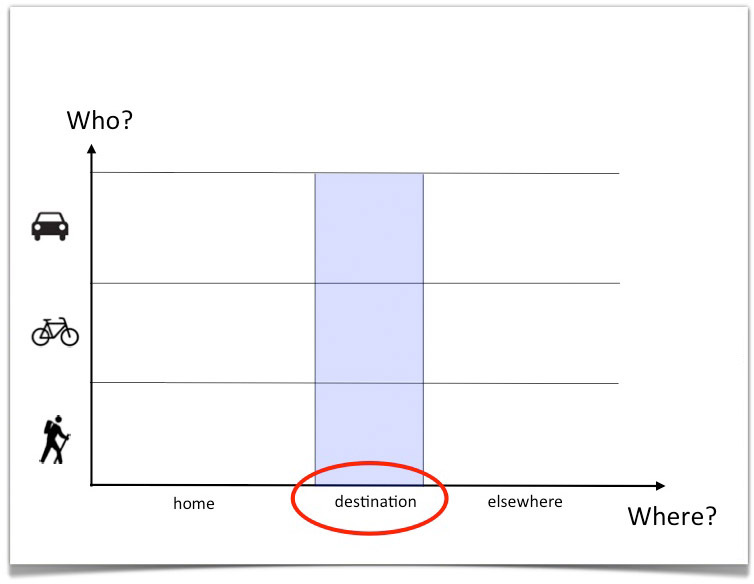 The x-axis is the place where the tourist is. Either at home. Or already at his respective destination. Or somewhere else (which you perceive to be your competition, if you are a destination). 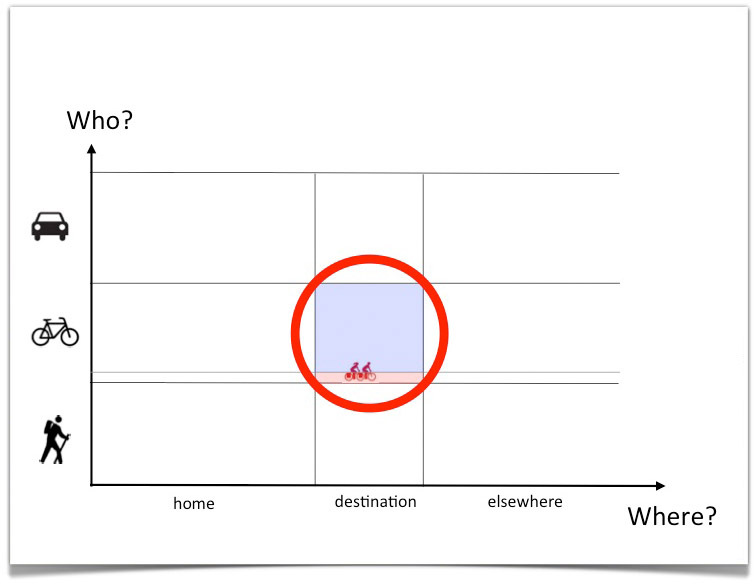 The y-axis shows the target groups according to themes. Cyclists, hikers or other car-driving tourists. 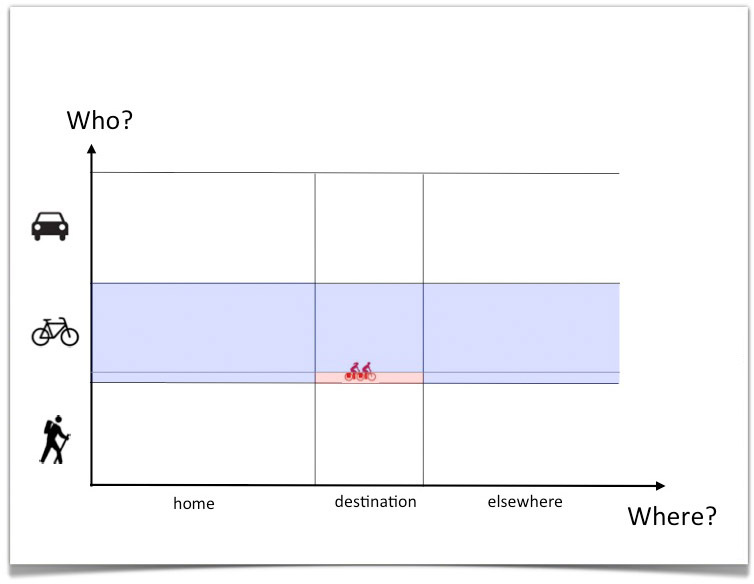 Let’s assume that you are the destination I’ve marked red. 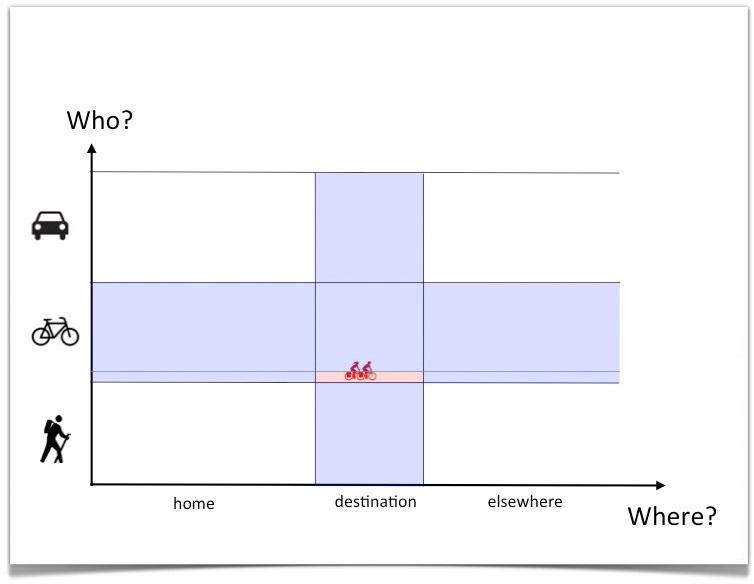 You are good at addressing guests across the entire range of target groups (blue section), who are (or soon will be) at your destination. And you want to convince them of the idea of cycling in your area. You want to put people into the following blue square. As many as you can. With the minimum possible effort. To come straight to the point, I have already marked a small part red. These are the cyclists among your guests who have booked a holiday through a tour operator. More on that later. But while we’re on the subject of tour operators. They work in a completely different way to destinations. They are in a completely different dimension! 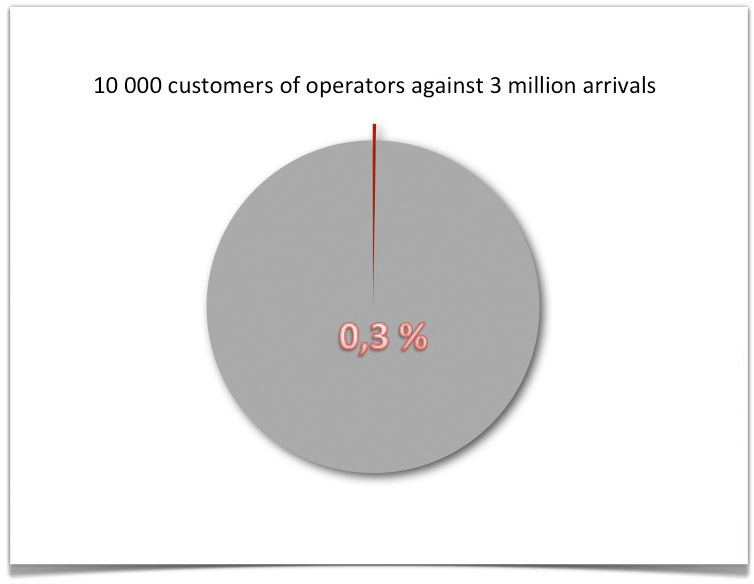 This is because at first glance tour operators are not committed to a particular destination. All the tour operator wants is for the customer to book the tour he wants. And it doesn’t matter where. Therefore tour operators operate in a theme-based manner when it comes to bike tourists. They operate within the blue area. But what do you want as a destination? You want both: you want as many cyclists as possible to come to your destination. 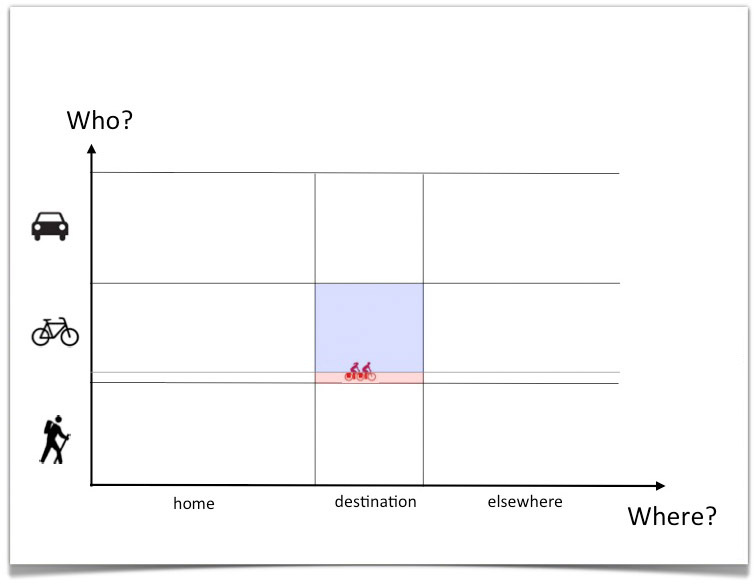 Once the customer has cycled to your destination, he will cost the normal customer-acquisition costs. Just like the tour operator. If the customer was already in your area on a bike holiday, he will almost definitely plan his next tour somewhere else. So you will lose the customer. This means you are able to create value from this customer the one time only. Depending on the quality of the holiday, however, a customer will book 3-4 holidays through the tour operator. 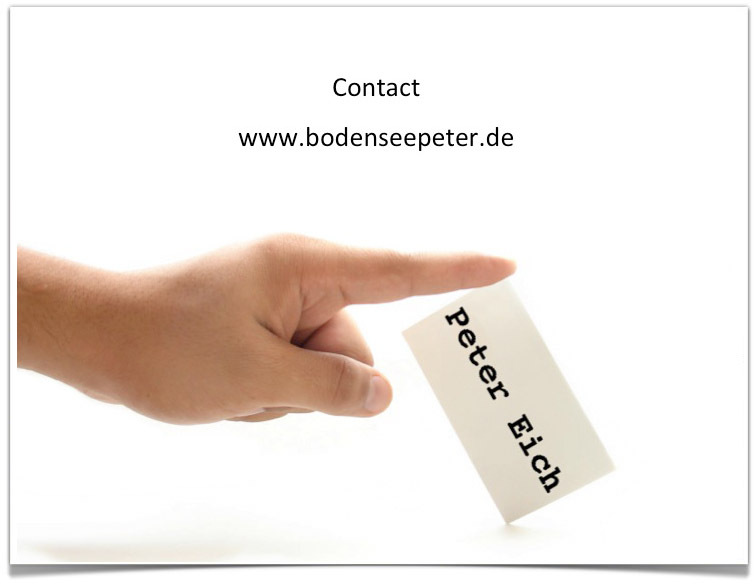 The added value of a tour operator is therefore 3-4 times greater than yours. 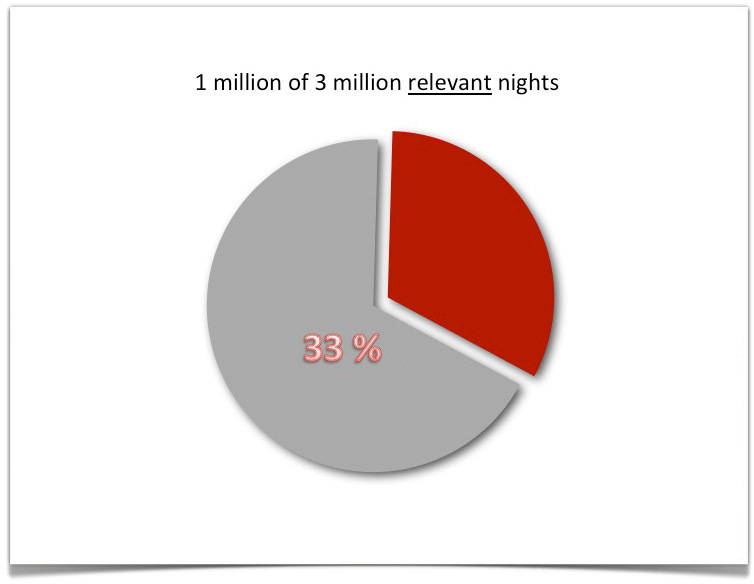 The tour operator is able to pay 3-4 times as much for marketing as the destination. In other words: the tour operator is 3-4 times better than you at marketing. And now I have come to the third part of my talk. 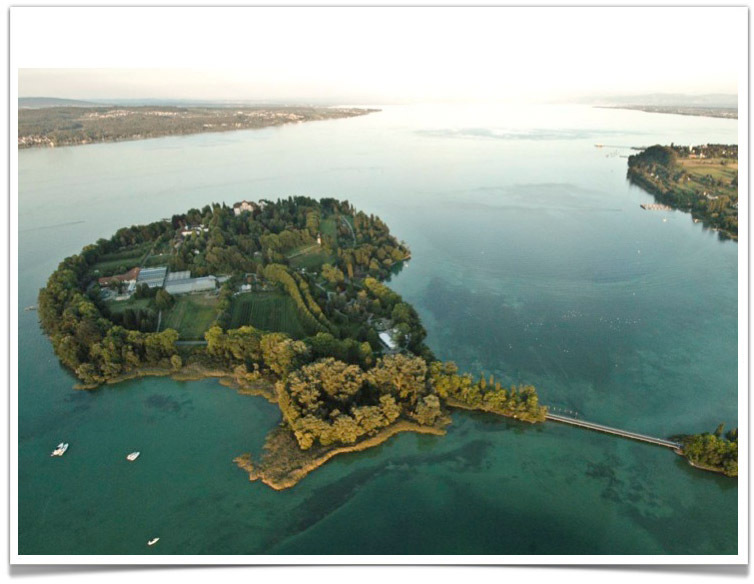 We, here at Radweg-Reisen, had a cooperation project with the island of Mainau. This is an island where cycling is prohibited. You’re not even allowed to take your bike onto the island. This is a shame as the island has two entrances. One by land and one by boat. It would be wonderful if you could cycle to one entrance and leave by boat with your bike from the other. That’s what we and the people from the Mainau thought. And that’s why we operated a shuttle service on the Mainau for a year to transport the bikes of our guests while they walked across the island. To make sure that the shuttle operated at full capacity, we changed all our cycle tours around Lake Constance so that they included the route over the island. This cooperation project lasted only one year. However in the years to follow, thousands of guests on bikes, on their own tours to the Mainau, arrived asking for the shuttle, which no longer existed. THAT was our aha-effect. As a cycle tour operator we were able to see and estimate roughly how many cyclists – who weren’t our customers – still cycle our routes. It worked out at about ten cyclists to each customer! Why do so many cyclists all cycle round Lake Constance in a clockwise direction and why do all travel guides describe the cycle path this way? For the same reason: because the tour operators offer this route as well. And it’s the tour operators who define the cycle path – not the signposts. I would like to go back to the matrix. You want to get as many cyclists into this blue field. I would advise you to concentrate on the small red area. 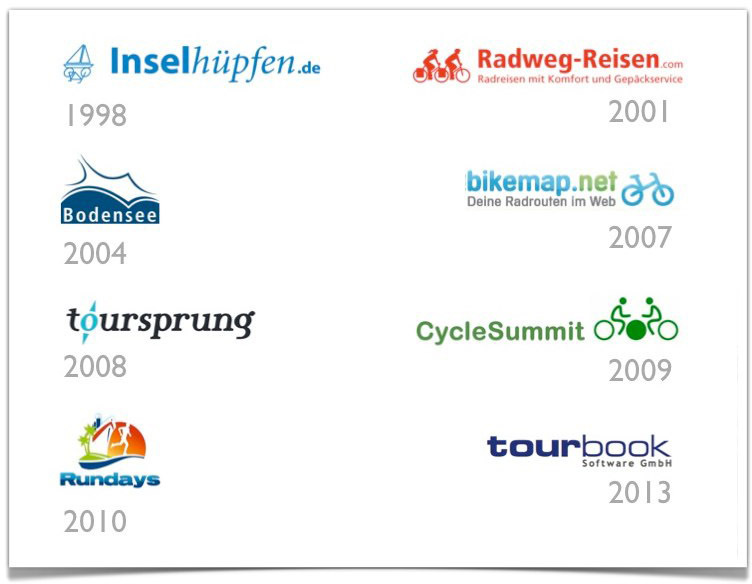 Enter into cooperations with cycle tour operators. For they are the shepherds leading your sheep. 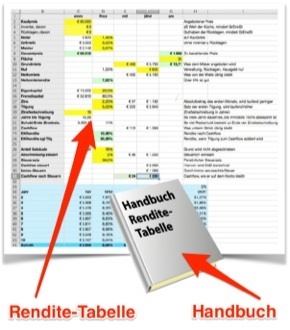 In this manner (and sticking to the figures we have for Lake Constance) with the small target group of about 10,000 arrivals through cycle tour operators you can leverage your marketing very effectively. 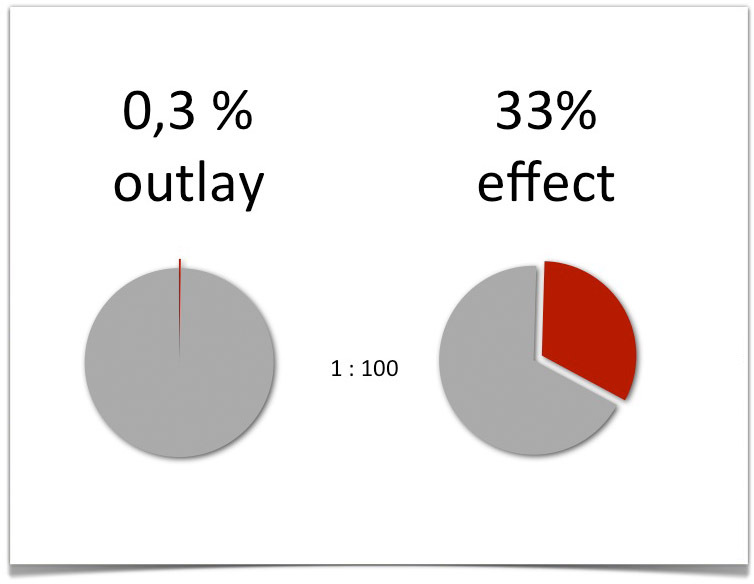 There is a factor of 100 between 0.3% outlay and 33% effect. And this isn’t in the price, but in the impact. Therefore, my final piece of advice: become acquainted with the cycle tour operators. Cooperate with them!